Adam DiMichele, recently cut by the Philadelphia Eagles, keeps all football options open. The distance was only feet away, but the worlds were miles apart. Adam DiMichele spent his Temple career suiting up for home football games in the Owls’ locker room at Lincoln Financial Field. This summer, DiMichele had his own locker just down the hall. After a successful career on North Broad Street, DiMichele earned a private tryout during offseason minicamps with the Philadelphia Eagles, who also play their home games at the Linc. “All you really need is one team to like you, and that’s kind of what happened with Philadelphia,” DiMichele said. “They gave me that opportunity. DiMichele signed a rookie free-agent contract with the Eagles on May 18. He was released less than a month later, but the staff told him to be ready for a phone call. That phone call came a month later, and DiMichele signed with the Eagles again on Aug. 12. DiMichele finished 14-for-22 for 130 yards and a 21-yard touchdown pass eight days later in a preseason game against the Indianapolis Colts. During his time with the Eagles, DiMichele had the opportunity to work behind and interact with quarterbacks Donovan McNabb, Michael Vick and Kevin Kolb. DiMichele’s journey started at Sto-Rox High School in McKees Rocks, Pa., where he was a three-sport All-State selection as a senior in baseball, football and basketball, earning state Player of the Year in the latter two. DiMichele finished his high school career as the Western Pennsylvania Interscholastic Athletic League’s all-time leading passer, breaking records set by Joe Montana, Dan Marino and Joe Namath. DiMichele’s high school career earned him a scholarship to Penn State, who saw him as a defensive player and wanted him to play in the secondary. DiMichele wasn’t too keen on moving to the defensive side of the ball, so he asked to be released from his scholarship. Penn State balked at the idea, so DiMichele could not play sports at any other Division I school for a year. He decided the quickest way to make it to a professional league would be by playing baseball, so he enrolled in Okaloosa-Walton College in Florida for two years. In 2005, the Toronto Blue Jays selected him in the 38th round of the Major League Baseball draft. But again, DiMichele said he wasn’t completely confident with his career path. So, after a brief stay at Penn State and two years on the diamond, DiMichele came to Temple, where he started at quarterback for three years. In his first year, DiMichele started nine games and threw for 10 touchdowns. 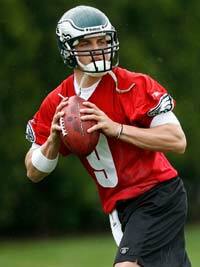 A year later in 2007, he threw for 12 touchdowns in eight games before a season-ending leg injury. Last year, he missed three games with a shoulder injury. DiMichele admitted his past injuries hurt his chances of getting drafted. After missing those three games in the middle of the season, DiMichele returned and threw for a touchdown in a win against Ohio. He finished his senior year throwing for 1,911 yards and 18 touchdowns while leading the Owls to a 5-7 record – their best finish since 1990. DiMichele, a recipient of the Owl Award and Captains’ Award in both 2007 and 2008, finished his career with 5,024 passing yards, which ranks fourth in Temple’s history. “I’m definitely honored,” he said. “If I could go back, I would share it with those other seniors because they did just as much as I did in turning this program around. I think we did lay the foundation for something great, and I think this should be a great year. It was a low day for DiMichele when he was again released by the Eagles after his strong preseason appearance. But a phone call from offensive coordinator Marty Mornhinweg and quarterbacks coach James Urban brightened his day, as they told him they were impressed with his competitiveness and how he played against the Colts. “They basically told me not to quit,” he said. “They think I can still play at this level, and they think I should play anywhere I can right now and get as much playing experience as [I can]. There is no doubt DiMichele still wants to play – the issue is where. He talked about the Canadian Football League and mentioned there are a few teams interested. Despite a 2-3 conference record, the Owls are still alive. The defense played poorly, while Chester Stewart started at QB.